The old Garmisch. Almost nowhere is it more tangible than in this place. Because around Kreuzstrasse, one can feel the charm of bygone days. It is also firmly rooted amongst the old farmhouses: The historic forge dating from 1813 defies the developments springing up around it with charisma. As does the man, who tinkers inside and practices a trade that required no managerial abbreviation. Florian Aberl is a blacksmith out of passion. A genuine craftsman - dirty hands, with a flat cap on his head and a relaxed nature. Stoking the fire while standing at the anvil deforming metal. But this was not always so. 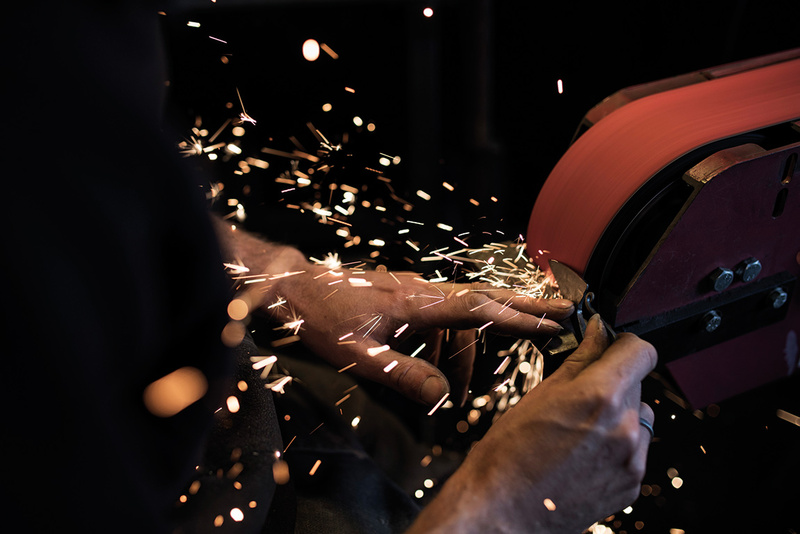 Through the 200-year-old pine door, with the honest smell of metal and fire in one's nose and one's eyes drawn to the innumerable tools and impressive machines. Above the workbench, rows of hammers and pliers that belonged to his great-great-grandfather, both anvils sitting on huge tuff stones from the Riess and the old machine with its v-belt drive saying "Caution, tighten nuts securely." The heart of it all is the large furnace, which glows every day and is decisive in shaping the metalwork. Nothing about this has changed over the course of time. 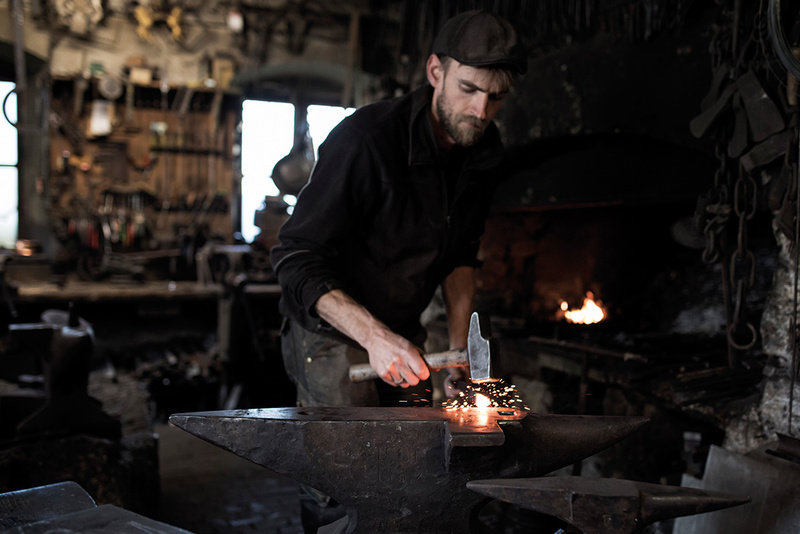 Not even the fact that a blacksmith is a real design all-rounder and can model the material in many different ways. Florian focuses in particular on utensils, construction hardware and tools. Through the latter, he has become known as the "man with the axe". Inspired by local forest workers, for example, he developed the 'Schlegaxt' (mallet axe) - a useful 2-in-1 tool. Apart from being resilient, he can also be practical. With hand-forged everyday utensils that combine the past with the present and bear the brand "For life". Such as the woodcutter's pan, which can be used to fry on both an induction stove and over an open fire. Or the small knife that combines grace and stability, cutting mushrooms, slicing Landjäger smoked sausages and disappearing into in hand-stitched leather case. Special orders also find their way into his workshop. Sometimes an old mail coach rolls in, or the Speyer Cathedral Museum comes knocking on the door. But back to the use and the objects he produces for this: Every one of his handmade products is for life and "has a certain 'Schlanz'"; they feel right. No two are exactly the same and all bear his individual style. Because when it says Aberl on the outside, you can be sure it's Aberl on the inside too.